The Diamond Anniversary celebrations have begun at the Disneyland Resort, and it wouldn't be a celebration without some sweet treats! 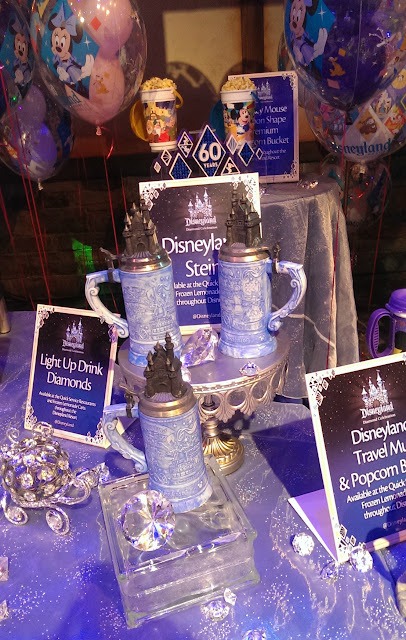 Limited time edible offerings include special desserts at your favorite Disneyland Resort restaurants, Diamond Anniversary versions of classic snacks, and other classic snacks served in special Diamond Anniversary souvenir containers. 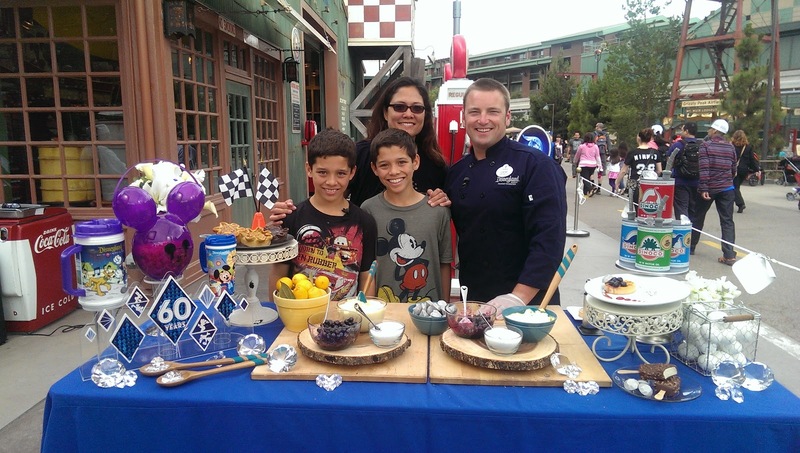 We had the opportunity to meet with one of the chefs at the Disneyland Resort, Chef Caine, who showed us how to prepare a Meyer Lemon Creme Brulee Tart, which can be enjoyed at the Blue Bayou Restaurant during the Diamond Celebration. I thought it would be fun to include 3Po and Jammy at the recording session -- but in hindsight may not have been the best decision, because they ended up gobbling most of that delicious tart, with almost nothing left for me! The Disneyland Diamond Cupcakes are so beautiful. A lemon flavored version is available at Disneyland's Jolly Holly Bakery Cafe, and an orange-flavored version is available at California Adventure's Fiddler, Fifer & Practical Cafe. Check out these Diamond Anniversary sugar cookies! One of my favorite sweet treats at the Disneyland Resort is the caramel apple. 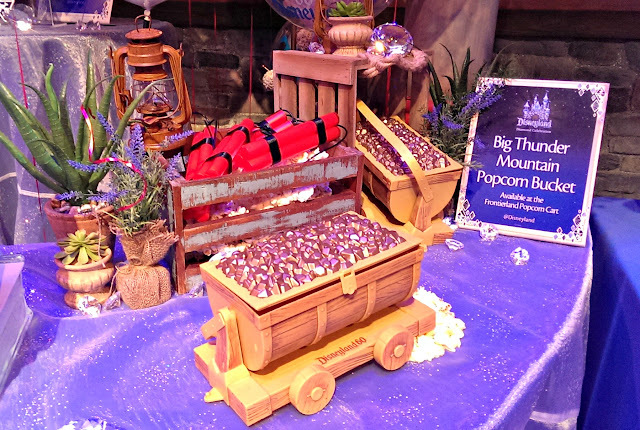 The Diamond Anniversary version has the apple dipped in milk chocolate, then half-dipped in blue-tinted chocolate, then rolled in blue sprinkles to give it a shiny look. 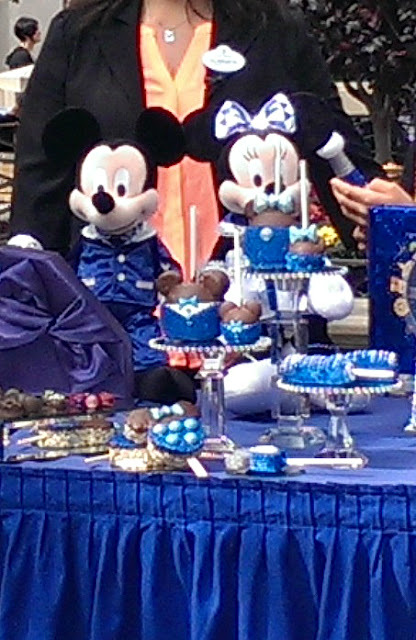 There's a Mickey version with a shiny blue bow tie, and a Minnie version with a shiny blue hair ribbon. There are also cake pops and rice krispy treats which look like smaller versions of the caramel apples. Don't forget the marshmallow wands dipped in caramel and chocolate! 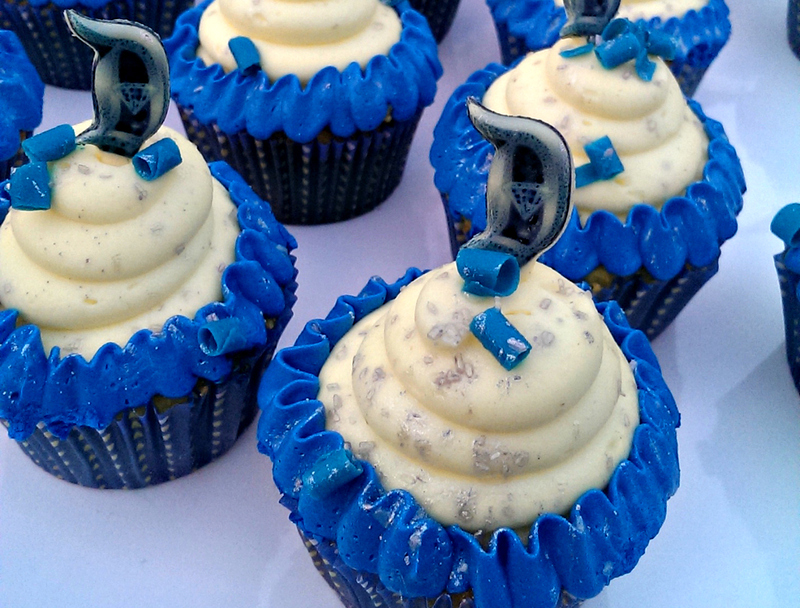 With sparkly blue coating and white chocolate drizzle, they are almost too pretty to eat. Almost. Sorry my photo is so blurry, I'm working on getting a better version! If you prefer regular soda or lemonade, you can get them in special new drink containers, like these oil can sippers over at Cars Land. They come in three varieties and they are adorable. A special souvenir stein has designs featuring Disneyland attractions, topped with a Sleeping Beauty Castle. It looks like it's made from ceramic and metal, but it's actually lightweight plastic. There was a special 32-oz drink container (fondly known as the "Bladder Buster") that was available only during the May 22 24-hour event, but you can still get a similar souvenir cup, in a more reasonable 16-oz size. Oh, and what's that thing that looks like a Mickey balloon with the handle between the two souvenir cups? Why, it's the new Diamond Celebration souvenir popcorn bucket! The lines at the popcorn carts are even longer than usual because everyone wants to get their hands on these adorable buckets. Other new souvenir popcorn buckets include the Big Thunder Mountain Popcorn Bucket (pictured below), shaped to look like a mine car, and the Cinderella Bucket (not pictured), shaped to look like Cinderella's pumpkin coach. 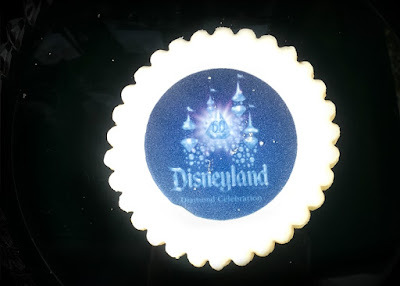 Disclosure: I was a guest of the Disneyland Resort at their May 2015 press event for the Disneyland Diamond Celebration. The views and opinions expressed here are my own. 1. Since opening day in 1955, the Disneyland Resort has welcomed more than 700 million guests to The Happiest Place on Earth. That number includes guests from approximately 200 nations, nearly every country in the world today. 2. Through the years, hundreds of famous individuals have visited the Disneyland Resort, including U.S. presidents (dating to Harry S. Truman), heads of state and countless athletes, artists, authors and celebrities. The guest list is a virtual “Who’s Who” of the 20th and early 21st centuries. 3. The Disneyland Resort now employs some 28,000 cast members, making it the largest single-site employer in Orange County, California. 4. Thirty-eight different languages are spoken among Disneyland Resort cast members. 5. More than 50 scuba divers work year-round to maintain Disneyland Resort attractions, including “World of Color” at Disney California Adventure Park and Finding Nemo Submarine Voyage at Disneyland Park. 6. More than 800 species of plants indigenous to 40 nations grow at the Disneyland Resort, making it one of the most extensive and diverse botanical locales in the western United States. The landscape includes colorful flowers, 22 topiary animals and characters, and approximately 18,000 trees. 7. Mickey Mouse ear hats are the most popular Disneyland Resort souvenirs of all time, with more than 84 million “ears” sold since 1955. New “crystal” ears and other creative designs will debut during the Diamond Celebration. 8. The Disneyland Resort generates $4.7 billion annually for the Southern California economy. 9. Debuting for the Diamond Celebration, “Paint the Night” will sparkle with more than 1.5 million individually controlled lights. Nearly all of those are energy-efficient, LED lights. 10. In addition to the LED lights on “Paint the Night” floats, each costume in the parade features its own sophisticated individual system of lighting controls. 12. In the new “Disneyland Forever” fireworks show, guests will enjoy pyrotechnics above them and immersive projections all around them: on Main Street, U.S.A., the mist screens on Rivers of America, the façade of “it’s a small world” and the Matterhorn. The largest use of projection mapping technology in any Disney Park will transform park locations into a magical canvas, transporting guests into Disney stories, from flying high above the London skyline with Peter Pan, dancing with King Louie of “The Jungle Book,” and seeing Nemo fly through the sky to Mount Wannahockaloogie. 14. A new show at Fantasy Faire in Disneyland tells the story of “Frozen,” Disney’s animated blockbuster film. The Royal Theatre’s resident storytellers, Mr. Smythe and Mr. Jones, tell the tale of Anna and Elsa in their own unique, wacky style. 15. In the Diamond Anniversary “World of Color – Celebrate!” nighttime spectacular, award-winning actor Neil Patrick Harris will appear in multiple film sequences with Mickey Mouse. They will host the show, with the help of some amazing special effects. 16. Part of the recent expansion of Disney California Adventure, “World of Color” uses a submersible platform that’s bigger than a football field, with more than 20,000 points of control and revolutionary lighting that infuses nearly 1,200 fountains with color — making it one of the largest show systems ever built. 17. “Anna and Elsa’s Royal Welcome” offers guests a special place to greet the popular sisters from “Frozen.” It opened in January, 2015, at the Disney Animation building. 18. The iconic Carthay Circle Theatre Restaurant and Lounge opened in 2012 on Buena Vista Street. It stands 79 feet 6 inches tall, to the top of its cupola spire, and it is approximately ¾ scale to the original Carthay Circle Theatre, the site where Walt Disney’s animated classic, “Snow White and the Seven Dwarfs,” premiered in 1937. By way of contrast, Sleeping Beauty Castle in Disneyland stands 77 feet high and is designed to appear taller, due to forced perspective, when viewed from the other end of Main Street, U.S.A.
19. For the Diamond Celebration, Carthay Circle Theatre and Sleeping Beauty Castle will glisten and gleam as never before with brilliant diamond enhancements. On Carthay Circle Theatre, the large “Diamond D” marquee was inspired by the 1930s Art Deco movement. 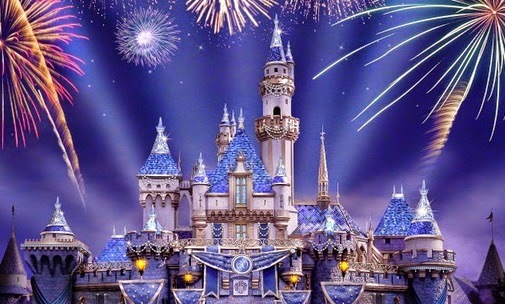 On Sleeping Beauty Castle, more than 100,000 blue, glass crystals will shimmer on the rooftops. 20. Cars Land is home to Radiator Springs Racers, the popular attraction that opened in 2012 at Disney California Adventure. After dark, the colorful and nostalgic appearance of the town of Radiator Springs features 16 neon signs in bright, luminous colors. 21. The cars of the Red Car Trolley attraction on Buena Vista Street are reminiscent of the historic cars of the Pacific Electric Railway system, which operated in Southern California from 1901 through 1961. 22. Disneyland Park opened July 17, 1955, with 18 ticketed attractions and five free attractions/exhibits. Opening Day highlights included the Jungle Cruise, Autopia, Mad Tea Party and Mark Twain Riverboat. Several other classic Disneyland attractions opened later in the year: TWA Rocket to the Moon on July 22, Casey Jr. Circus Train on July 31, and Dumbo Flying Elephants on Aug. 16. 23. During construction of the park, and occasionally until he passed away in 1966, Walt Disney would stay overnight in a small apartment above the Main Street Fire Dept., next to Disneyland City Hall. Today, a lamp shines continuously in the apartment window in tribute to the spirit of Walt Disney. 24. When Disneyland opened there were no A, B, C, D and E tickets. Guests paid for park admission and purchased attraction tickets inside. The first ticket books (A, B and C tickets) appeared on Oct. 11, 1955. The first E tickets appeared in 1959 and were used for newly opened attractions, Matterhorn Bobsleds and Submarine Voyage. 25. The skilled artists in the Silhouette Studio on Main Street, U.S.A., can create a silhouette portrait in 60 seconds or less. 26. The names and titles of the second-story shop windows along Main Street, U.S.A., pay tribute to cast members and others who contributed to the creation and development of Disneyland. Most of the shop names feature whimsical references to the professional specialties or hobbies of the individuals honored. 27. In contrast to the Main Street, U.S.A. windows, the second-story windows in Mickey’s Toontown are a treasure trove of trivia for Disney animation fans. 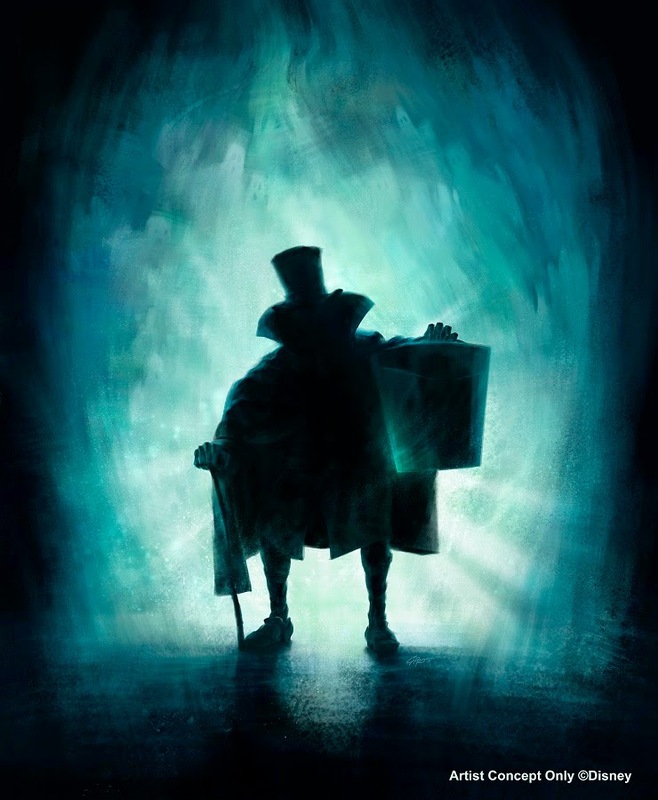 They reference characters such as Scrooge McDuck and Jiminy Cricket, along with relatively obscure early-era Disney characters such as Clara Cluck and Toby Tortoise. 28. The Matterhorn Bobsleds was the first tubular steel roller coaster in the world when it opened in 1959. It set the standard for modern-day roller-coaster design. 29. Disneyland created the first daily operating monorail in the Western Hemisphere. opened June 14, 1959. Since then, the Disneyland Monorail has traveled approximately 780 million miles, enough for eight round trips to the planet Mars. The current Disneyland Monorail vehicles, the Mark VII models, debuted in 2008 and are the fifth generation at Disneyland Resort. Two other models, Mark IV and Mark VI, have been featured at Walt Disney World in Florida. 30. The Apollo moon landing in 1969 was shown live on television to Disneyland guests at the Tomorrowland Stage. 31. Having been outdone by NASA in 1969, the Tomorrowland Rocket to the Moon/Flight to the Moon attraction became Mission to Mars in March, 1975. The rocket took its final flight in 1992 and the location eventually transformed to Redd Rockett’s Pizza Port. 32. The adventures of Snow White, Peter Pan and Mr. Toad have been on display as Fantasyland “dark rides” since opening day at Disneyland. Alice in Wonderland joined this lineup in summer 1958. Pinocchio appeared in 1983 as part of the extensively enhanced “New Fantasyland.” Adding “new magic” to these classics, Imagineers recently used projections to enhance scenes in Alice in Wonderland and Peter Pan. 35. The charming, New Orleans-themed Blue Bayou Restaurant is located inside Pirates of the Caribbean, where dining guests can watch the attraction boats glide past. The Blue Bayou is sometimes cited as the inspiration for the many “themed restaurants” around the country today. 36. The first version of the “Disneyland Main Street Electrical Parade” appeared in 1972 and went on hiatus after summer 1974. A second-generation “Main Street Electrical Parade” premiered in 1977 and ran for 20 years, retiring in 1996. It reappeared, as “Disney’s Electrical Parade” in Disney California Adventure Park from 2001 to 2010. 37. Beginning in 1997, Disneyland started celebrating the holidays with the seasonal re-theming of “it’s a small world” as “it’s a small world” Holiday. This was followed by Haunted Mansion Holiday for the Halloween and Christmas seasons beginning in 2001, Space Mountain Ghost Galaxy starting in the 2009 Halloween season, and Jingle Cruise for the 2013 holiday season. 38. The “it’s a small world” attraction remains very popular with guests, more than 50 years after debuting at the 1964 New York World’s Fair. Guest research shows that one in four Disneyland guests – families with children and those who grew up riding the attraction – consider “it’s a small world” a tradition. They plan a voyage whenever they visit the park. 39. Of the five engines on the Disneyland Railroad, four are named for founders or executives of the Santa Fe Railroad. (The attraction was originally known as the Santa Fe & Disneyland Railroad.) The fifth engine, the “Ward Kimball,” is named for Disney Legend, animator and train enthusiast Ward Kimball (1914-2002). 40. The trains of the Disneyland Railroad have accrued enough mileage during the past 60 years to travel to the moon and back more than 250 times. 42. In the early days of Tom Sawyer Island, the surrounding Rivers of America were stocked with catfish and fishing was allowed off the island’s docks. 43. The King Arthur Carrousel in Fantasyland was assembled from parts of several genuine 19th century carousels. The horses, ridden by hundreds of guests every day, are more than 100 years old. They are fully restored, one row at a time, every year. 44.Guests will find more than 140 food and beverage locations at the Disneyland Resort, including 26 full-service restaurants and themed lounges such as Trader Sam’s Enchanted Tiki Bar at the Disneyland Hotel. 45. Disneyland Resort serves more than 6,700 food items, including citrus-marinated turkey breast at Flo’s V8 Café (Disney California Adventure), Hacienda Chicken Caesar Salad at Rancho del Zocalo (Disneyland) and Fire Cracker Duck Wings at Carthay Circle Restaurant and Lounge (Disney California Adventure). 46. Popular snack items at the resort include gluten-free Dole Whips (2,000 consumed each day) and Mickey-shaped soft pretzels (2,000 consumed per day). 47. During the Diamond Celebration, special anniversary cupcakes will be offered at the Jolly Holiday Bakery Café in Disneyland (lemon flavor) and the Fiddler, Fifer and Practical Café in Disney California Adventure (orange flavor). 48. Fresh fruits and healthful options are available throughout the parks, and guests may look for the Mickey Check () on menus in both quick service and table service restaurants to find options that meet Disney Nutrition Guidelines. 49. The number of bananas consumed by Disneyland Resort guests in a year could feed Abu (Aladdin’s monkey friend) 20 bananas a day for 62 years. 50. Napa Rose, the award-winning restaurant at the Grand Californian Hotel, has a 17,000-bottle wine cellar with more than 1,000 different labels and 80 wines available by the glass. The wine service ranks among the best in the country, with more than 30 certified sommeliers, including five who are certified at advanced level. 51. The Disneyland Hotel opened in October 1955 with 100 rooms. Today it offers guests 975 rooms, themed swimming pools, two towering water slides and five Signature Suites – including the Mickey Mouse Penthouse and Adventureland Suite. 52. Disney’s Grand Californian Hotel & Spa, which opened in 2001, was the first Disney hotel built “inside” a theme park, with an exclusive guest entrance into Disney California Adventure. It now includes Disney Vacation Club villas. 53. Disney’s Paradise Pier Hotel features seaside-inspired rooms and the sensational California Streamin’ water slide into the rooftop pool. All three resort hotels offer guests early admission to Disneyland or Disney California Adventure with Extra Magic Hour. 54. Build-A-Bear Workshop is the only location in the Build-A-Bear chain to carry exclusive Disney branded merchandise and animals. The location plans to create exclusive accessories for their bears featuring the Diamond Celebration. On average, more than 3,000 new “friends” are built in the store each week. 55. RideMakerz proudly displays an original company branded NASCAR vehicle hanging from the ceiling. The car actually raced during the 2008 Daytona 500. 56. The aquarium tanks at Rainforest Café contain more than 500 fish and approximately 60 different species, including a four-foot-long honeycomb moray eel. 57. AMC Theatres recently opened an IMAX theatre and features hearing and sight-impaired equipment in their location for disabled guests. 58. LEGO Store features three Disney character-inspired statues made of LEGO bricks. The Beauty and the Beast model was built with 649,350 bricks; the Buzz & Woody are made of 675,000 bricks and the Sleeping Beauty Dragon required 2,785,950 bricks. 59. The House of Blues Anaheim venue was recently ranked seventh on Billboard Magazine’s “Top 25 Most Popular Music Clubs” in the United States. The location will feature a souvenir guitar pick and specialty cocktail for the Diamond Celebration. 60. ESPN Zone boasts more than 120 televisions, including individual screens in all of the restrooms. The location features a 10,000-square-foot arcade as well as the unique ability to host and broadcast radio and television programing from inside the venue. Disclosure: I attended a press event at the invitation of the Disneyland Resort. The views and opinions expressed here are my own. May: Danny and the Dinosaur, the story of a boy who meets a prehistoric playmate in a museum. June: A Green Green Garden, where Little Critter and his family plant and grow their own fruits and vegetables for dinner. How cool is that? I'll be attending tomorrow's storytime event at our local Chuck E. Cheese, so stay tuned for photos! In addition, Chuck E. Cheese's is starting a summer reading program which awards young readers with 5 free tokens! Just download the Reading Rewards Calendar at chuckecheese.com/activities, log reading activities on the calendar, and take it in to the store to redeem the tokens. Disclosure: I received a gift card to Chuck E. Cheese's to facilitate this post. The views and opinions expressed here are my own. May is always a special month for me, because Mother's Day and my birthday are in May. 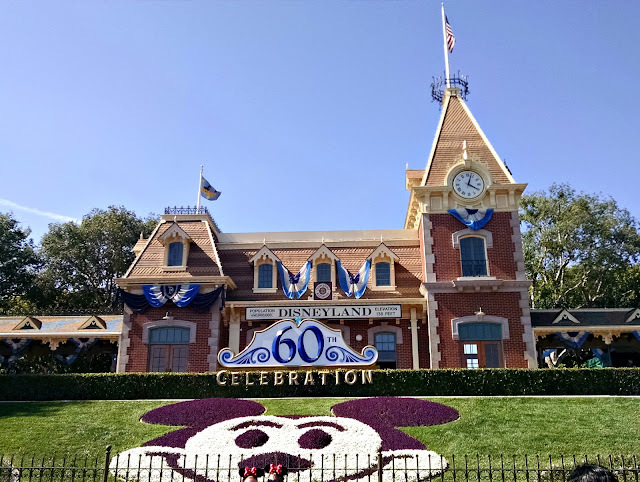 This year I've got an extra reason to celebrate, because I'm going to the Disneyland Resort to celebrate Disneyland's 60th anniversary on my birthday! The Diamond Anniversary celebrations will kick off with a 24 hour party starting 6:00am on Friday May 22! The fun continues nonstop till 6:00am on Saturday May 23. There are so many special things going on during those 24 hours, the time will just fly by! Guests will enjoy, and you may have read about some of them.... but the Disney folks have been releasing them in dribs and drabs over the past few months. So I've compiled all of the fun and magic (and links!) into one single post. Here is the full list of all the magical opportunities for families to enjoy the Diamond Celebration. Disneyland Park will light up the night with a new nighttime parade called Paint the Night. With over 1.5 million LED lights flashing and glowing, it's like the old Electrical Parade meets 21st century technology! Even the dancers and props will light up. All-new parade stars include a 54-feet long Mack Truck from Cars, plus Anna and Elsa! World of Color show has a new theme: Celebrate! The Wonderful World of Walt Disney. Neil Patrick Harris will join Mickey Mouse in reliving Walt Disney's story, featuring music, fountains, lasers, plus animation and live action film projected onto a watery canvas. Disneyland's new fireworks show, Disneyland Forever, is going to be like no other fireworks show. Projection mapping technology will immerse viewers in dozens of Disney movie worlds, from The Lion King to Finding Nemo to Mary Poppins. The show will be viewable not only from Main Street USA, but also from It's a Small World, the Matterhorn, and the Rivers of America, with a different view from each location. Guests can enjoy special treats only available during the 24-hour event, such as a Mocha Chip Funnel Cake at the Stage Door Cafe, Creamy Corn Chowder at French Market Restaurant, and Bananas Foster French Toast at Cafe Orleans. I'm definitely going for the Barbecued Pulled Pork & Slaw Cone at the Cozy Cone Motel! If you're going to the 24-Hour event on May 22, make sure you stop by a souvenir shop and check out the special 24-Hour tshirts and pins, because they'll only be on sale during the 24-Hour event! In fact, they might even sell out before the 24 hours are over! Throughout the Diamond Celebration year, performers will invite park guests to become part of the show at several places throughout the parks. Guests can march along with the Disneyland Band at a daily Diamond March-Along up Main Street USA, sing along with the Dapper Dans quartet, dream along with the Red Car News Boys on Buena Vista Street, dance along with Five & Dime, and party in Wonderland at the all-new Mad T Party. It wouldn't be a celebration without treats! Guests will be able to indulge in special Diamond Celebration Cupcakes, special drinks, Rice Treats, Caramel Corn, and Cotton Candy. I'm definitely saving space in my belly for a cupcake -- and I'm washing it down with the special mango, pineapple and passion fruit Lucky Fortune Tea! And don't forget the special popcorn buckets! 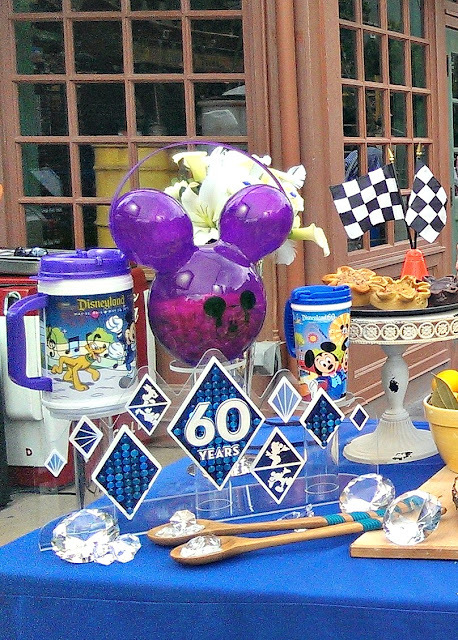 More than 500 merchandise items will be available to purchase during the Diamond Anniversary Celebration. Think blinged-out ears, hats, shirts, jackets, Vinylmation, pins, bags, mugs.... I can't wait to go shopping! 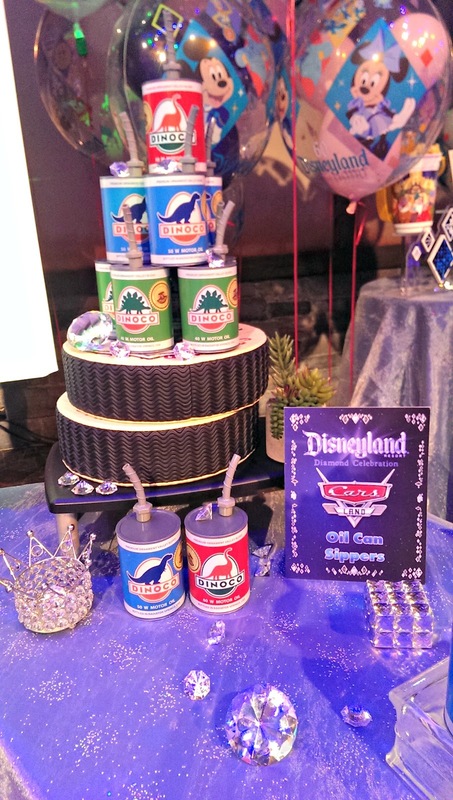 Disneyland only turns 60 once, so every single item in the Diamond Anniversary merchandise is sure to become a collector's item! Have your photos taken in front of Sleeping Beauty's Castle and the Carthay Circle Theater, because they've been blinged up for the Diamond Celebration! And don't forget to check out the newly decorated store windows on Main Street USA, which have been specially done for the occasion. 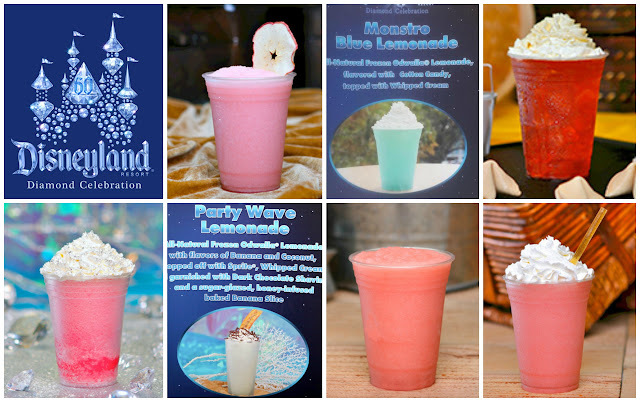 Many of the attractions that you've been waiting for have returned, and they've been bedazzled! The Matterhorn Bobsleds, Peter Pan's Flight, and Soarin Over California have been given new special effects. There's a new ghost in town over at the Haunter Mansion -- watch out for the Hatbox Ghost at the opening of the cemetery scene! Finally, the remodeled and expanded Grizzly Peak is reopening to the public. 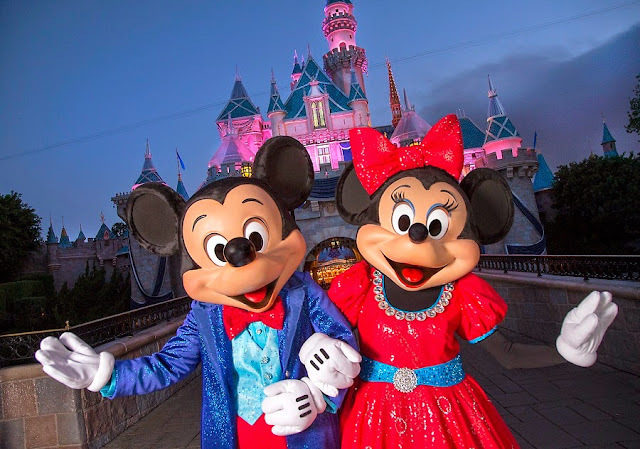 The Diamond Days Sweepstakes begins on May 22, and guests to the Disneyland Resort can win daily prizes such as VIP tours and dining experiences. 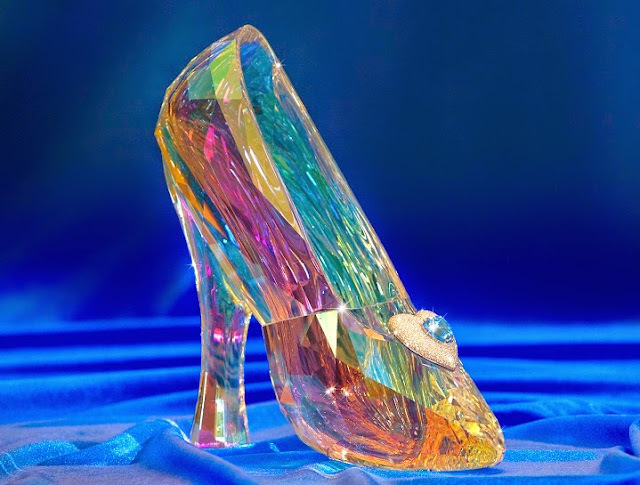 There are even more spectacular weekly prizes to be won, including real Disney Diamonds, a Cinderella glass slipper, a private party in Fantasyland, and a stay in the Disneyland Dream Suite. Disclosure: I am attending the Diamond Celebration press event at the invitation of the Disneyland Resort. The views and opinions expressed here are my own.